Though a bit late, the important parameters have improved and become "Positive" after our previous MW-3. Seeing the development now, I would vouch for the Monsoon arrival date for Mainland Kerala mentioned in MW-3. The heat is on in the Gujarat, Rajasthan/Sindh regions from the last 8 days, so chances for the seasonal low to form and establish itself soon.Today the pressure at MSL is 1002/1004 mb, with the core at 1000/1002 mb. Gradient not enough. The sub Continent hot spots have just about touched the 48c mark in Pakistan (Balochistan/Sindh) and around 47c in India. Should head for the 50c mark in Pakistan between 21st-25th May. BB-1 has got the Eastern end of the ITCZ Northwards, and very favourable for the Monsoon (Bay Branch). Easterly flow has now commenced at 8N.Western Disturbance M-3 will slightly upset the Northward track of the 200 hpa Easterlies. Well established in the Southern Hemisphere region. SE winds, with sufficient speed hitting the East African coasts, and gaining sufficient speed as Westerlies South off Sri Lanka. Winds are now picking up, and rubbing the Somali coast at sufficient speed in getting the "Somali Current" established. The SST off the Somali Coast is 23/25c, While the required SST in First week June is 19/20c. 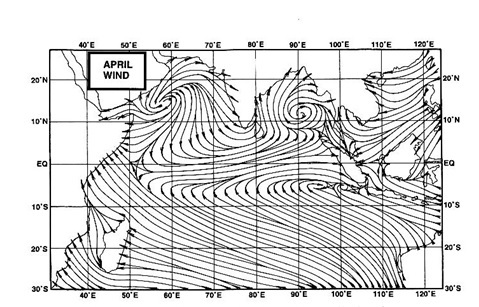 (Required to form masses of Monsoon clouds in the warm central Arabian Sea). The Bay Low has formed...in good time, and BB-1 is helping the Bay Branch of the Monsoon. 5. ENSO factor in arriving at the rainfall amount is also of importance. The interface is the sea surface: that is where the transfers of water (evaporation/precipitation) and momentum occur. (An accurate coupling of the fast atmosphere to the slow ocean is essential to simulate the ENSO, which in turn can simulate the inter-annual variability of Indian monsoon.) Unfortunately, getting an accurate, or near to accurate forecast of the ENSO for the next 2 months is difficult, with no guarantee of accuracy or performance surety. We still see El Nino lingering now. But, there is a possibility of a Neutral event occurring as early as July. Now, this would result in enhanced rainfall from July/ August. That is the best thing we want. But I would not endorse the timing of the event as yet. I would give it a 50-50 chance for Neutral ENSO by June/July. Pulses from the Eastern Pacific area, that is S.China sea, would mean depressions and systems forming in the Bay. 'In Situ" systems and systems from the Far east would contribute to the rainfall to the east Coast, move thru Central India and into Gujarat and even into Sindh (Pakistan). El-Nino, even a mild one like the current May condition, would sort of restrict these pulses, and in fact encourage WDs into coming down south, more South than normal. But, we would have to hope and pray for the Neutral conditions to prevail by June/July and hang on beyond September. again. Rajesh sir,I agree that i have referred to a site showing weather forecast that was the bbc weather which is reliable,besides various weather forecasting sites such as accuweather,weather channel ,etc are non reliable and they give non-reliable and erratic forecasts.As we all know that it isn't that easy to predict nature.I am 14years old ,i have been following your forecasts since 2012 ,i have learnt many things from your forecasts,and have found that almost all your forecasts have turned into reality.Its not easy to give a steady forecast unlike others who withdraw their forecasts every minute,your forecsts are appreciable and worth praising!!! IMD predicts a delayed onset over kerala (7TH JUNE). Any changes in monsoon arrival dates from your side ? abizer: I shall encourage and guide you as much as possible. Be free to ask. Sir what about Mumbai and Lonavla for 18th-21st can we expect rain? Karan/Emkay: I have mentioned in MW-4, the article above, that I keep the SWM arrival date for Kerala as mentioned in MW-3 of 5th May...the date for Kerala was announced as 4th/5th June in MW-3. Hrishikesh: Can expect rain on that date depending on the movement (if) AS-1 forms as mentioned. Do u think all other regions will also see delay in onset? Subsurface waters anamolies of Pacific put la nina as more favorable to la nada for mid July and after wards. Though u don't consider but negative iod is likely to be moderately to highly negative during swm 2016 which is biggest threat to swm 2016. I think swm 2016 is likely to be 10-15 % below normal, if not then above normal ms is absolutely unlikely to happen. how does western pacific effects on MonSoon? least cyclones during La Nina/Neutral? or movement of cyclons?